The Parson's Paper Mill in Holyoke, Ma, built in 1853, was extensively damaged by a fire in 2008 several years after the mill closed. The site of an historic paper mill in western Massachusetts is going to be redeveloped to create new jobs and sources of renewable energy. 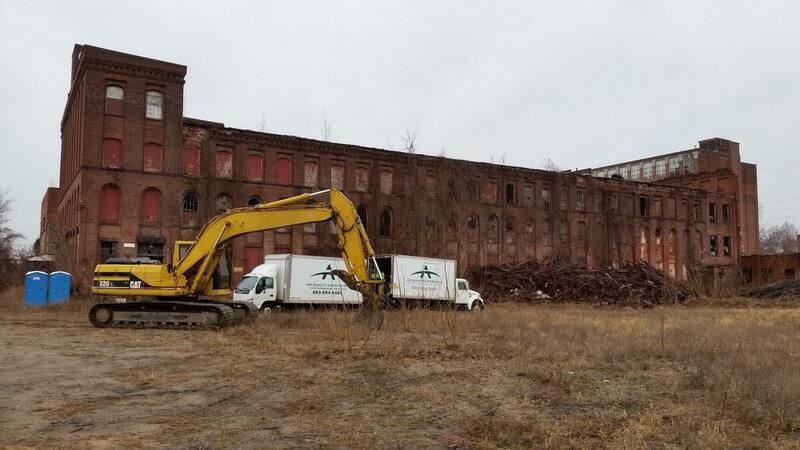 Holyoke Mayor Alex Morse announced a $10 million deal Monday to clean up and redevelop the former Parson’s Paper Company mill. The project will rid the city of significant blight, expand manufacturing, and create at least 30 new jobs. The 4.7 acre site will be taken over by Aegis Energy Services, a Holyoke-based manufacturer of co-generation heat and power systems that are used in hotels, apartment buildings, hospitals and other institutional settings. The expansion will increase the company’s square footage by 200 percent. Morse, who spoke on the mill property under a tent as rain and sleet pounded down, said the announcement should be celebrated as a milestone in the city’s revitalization.
" I can not say enough about how significant this project is the for the city of Holyoke," said Morse. " As you know, it is part of the larger revitalization efforts throughout our city." Parson’s Paper was established in 1853, in what was the beginning of an influx of mills to Holyoke, which came to be known as “The Paper City.” A fire in 2008 extensively damaged the vacant mill. Morse praised the staff of the city’s Office of Economic Development and the Law Department for resolving numerous legal, environmental, and financial challenges that had long impeded efforts to redevelop the property. He said talks began with Aegis officials in December 2014. "We've been working overtime ever since to make sure we had everything it took to clean up the site," said Morse. " We had to amass difference sources of funding to make it realistic for us." The state is putting $2 million towards the cleanup from the MassDevelopment Brownfield Fund. Holyoke Gas and Electric is paying $1 million in exchange for access to hydroelectric generators on the site. Aegis is getting an extraordinary 10-year 100 percent tax exemption from the city in return for an investment of almost $7 million, the creation of 30 new jobs, and the retention of 65 existing jobs, according to Marcos Marrero, director of the city Department of Planning and Economic Development.
" It is a way to have a city contribution to the clean up without having to put up cash when the budget is so tight. And it comes at a very low opportunity cost to the city seeing as how the site has not produced any taxes in a decade." Demolition and cleanup work on the property began last Friday and is expected to take until August to complete. Aegis has added 20 jobs during the last two years and is outgrowing its current manufacturing space which abuts the Parson’s mill property, according to Aegis Chief Operating Officer Joe Goding. "We will have our office building and testing and manufacturing site here. We'll join the two properties with a bridge. This will give us an option to ship equipment in and have loading docks in the back. It is fantastic," said Goding. The redevelopment plans call for one 40,000- square foot building in the complex to be preserved and rehabilitated. The open space that will be left when the bulk of the 300,000- square foot mill is razed is being considered for use a solar farm, according to Goding. A federally-funded brownfields cleanup project is under way in Holyoke, Massachusetts to demolish a former auto service facility that has sat vacant and unusable for more than two decades. A former coal-burning power plant, blamed by environmentalists for polluting the air in western Massachusetts, is being considered as a site to produce clean, renewable energy. A year-long study into redeveloping the Mount Tom Power Station has come up with three reuse options for the 128-acre property that sits along the Connecticut River in Holyoke. Each of the three scenarios includes a solar power facility.